Come and enjoy a night of family fun with eating, dancing, and more! Join Soto Mission of Hawaii Shoboji in celebration of its 2018 obon festival, a summer tradition steeped in Japanese culture, religion, and heritage! Remember those loved ones who have passed in this tradition brought to Hawaii by Japanese immigrants! Soto Mission of Hawaii Shoboji is located on the island of Oahu, in the city of Honolulu. The temple was originally located on Hall Street at the beginning in 1913. 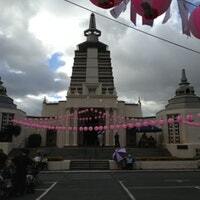 However it was moved to the corner of Nuuanu at School St. where the Japanese style temple was built and dedicated in 1921. Currently the temple is located near the Japanese Consulate with an architectural structure that comes from India, inspired by the temple at Bodhgaya where Shakyamuni Buddha is said to have attained Enlightenment. Friday, 8/17 - 7:00-10:00 p.m.
Saturday, 8/18 - 7:00-10:00 p.m.
daniyang8 . Última actualización Jul 12 2018 11:41 a.m.